Wedding decor is one of the most important things that make your wedding pictures look amazing. In 2018, couples no longer want the done-and-dusted wedding stage decoration. They want something that’s fresh, hatke and reflects their personal taste. To give you some reception stage decoration ideas, I have curated a list of 40 best wedding stage decor photos that you can show to your decorator and have the wedding decor of your dream! This grand floral reception stage by Solomon Management is surreal! Trust Solomon when it comes to providing you with exactly what you want! This kind of wedding stage decoration is perfect for the couple who has a classic Indian-themed wedding. The gold and red colours look festive and traditional enough for a beautiful wedding function. A beautiful pop of colour along with some white and pastel flowers makes for a simple yet gorgeous marriage stage decoration. Perfect for the couple who likes a hint of colour, but nothing that’s too loud! 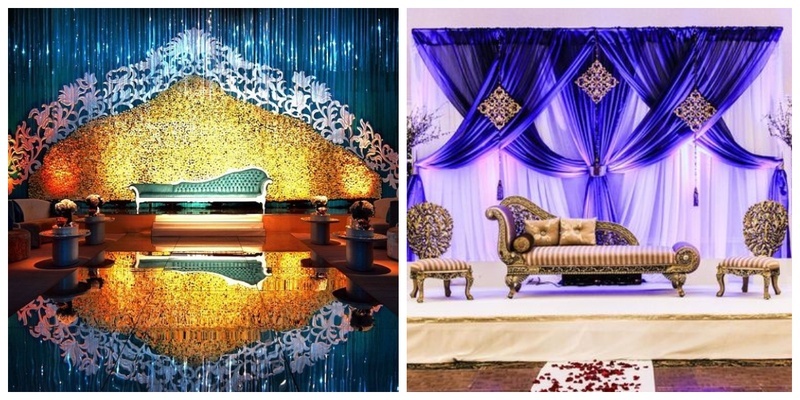 A wedding stage decor that looks right out of an Indian palace! Now, who wouldn’t like that? This kind of marriage stage decoration with huge sets and chandeliers is ideal for those who are looking for reception stage decors without any flowers. If you want to keep your wedding decor classy and, an all-white theme like this one is a great option. The use of white florals in the backdrop as well as at the foot of the stage make this decor look stunning. This beautiful reception stage decoration looks like a living model of Van Gogh's Starry Night, doesn’t it? A night sky inspired stage decor is something that looks stunning and is definitely for the hatke couple! Replete with golden arches, colourful curtains, bright flowers and huge sofas, this kind of Indian theme stage decor is perfect for couples who like decorations that are old-school but classic. This gorgeous white wedding decor is actually a money-saver in disguise. The beautiful gazebo-like structure can be your mandap as well as reception stage after the marriage rituals. Just take off the havan kund and pooja material and replace it royal looking chairs to convert the mandap to a reception stage! Win-Win, isn’t it? If you are a candle lover like me, then you’ll fall in love with this reception stage decoration as soon as you see it. The simplicity of white flowers, white drapes and a shelf backdrop with candles all over is big thumbs-up for beautiful wedding photos! Nothing is more classic Indian themed than a paisley and blue drapes backdrop! The regal sofa plus the two lanterns on either side just add to the overall charm of this Indian stage decoration. If a wedding stage decoration full of flowers and beautifully placed lights is your only requirement, then this wedding stage image is all you need for your inspiration! If a royal Indian look is what you want for your wedding stage, then this kind of stage decoration is perfect for your big day. The gorgeous white flowers, crystal chandeliers and gold-accented sofas give this wedding decor total #royalvibes! Give a grand feel to your wedding stage by choosing a marriage stage decoration that looks like it’s a part of some royal palace. The combination of white, gold and purple in this wedding stage decoration image has me going gaga over its sheer beauty. One of the quirkiest wedding decor ideas, this beautiful stage setup reflects freshness, greenery and vibrancy in one frame. If you want something that’s floral but not too flowery, this wedding stage decoration is just the perfect pick for you! 15. Elegant wedding stage decoration at its best! If you had to capture elegance in one frame, this is exactly what it would look like! A simple and minimal wedding stage decoration, this one is ideal is you have a modern classic taste. What’s more? This decor can be chosen if you have a space crunch at your venue as it does not occupy much space. Is there a better colour combination than blue and red for stage decor? Well, this wedding stage image is surely giving some #royalvibes with its use of blue and red drapes, chandeliers and regals white sofas! They say the best looking things are minimal and tasteful. This reception stage image is a testament to that. It is simple, graceful and absolutely stunning! Am I right? A larger than life backdrop of flowers, golden lights and an arch makes this stage decoration look exquisite. The long sofa in emerald green with a reflective floor just add that final bit of oomph factor to the entire setup. Displaying a beautiful riot of yellow, this stage decoration is apt for couples who want to skip the orchids and carnations, and stick to the good-old genda phool! And must I say, this looks truly desi as well? This kind of grand stage decoration is perfect for weddings that take place in open spaces. The sheer grandiose of this stage decoration is awe-inspiring in itself. The use of pillars, flowers and pink colour makes this a great Indian themed stage decoration. A simple canopy of white and pink flowers along with pink drapes, white pillars and sofas make this stage decoration is a simple yet eye-catching option for those who like to keep it low key! A beautiful purple theme stage decoration, this one has all the elements that make a wedding decor look nice. The chandeliers, grand sofas and perfectly lit backdrop add to the grace of this marriage stage decoration. If you are looking for Indian wedding decoration that is a little offbeat, then this stage decor image fits your requirement. The use of royal blue and white drapes with antique sofas makes this wedding stage design stand out from the crowd. This wedding reception stage decoration is apt for an outdoor reception because of its sheer size. The lovely backdrop of white pillars with flowers and lights along with the sofa is truly a sight to behold. If your approach to wedding decoration is traditional, then a stage decor like this one looks absolutely magnificent. The use of golden pillars, Indian flowers and godly motifs makes this wedding stage decoration one of my favourite Indian theme decorations. If you want a simple and romantic-themed floral stage decor, then this picture is all the inspiration you need to set up your reception stage. The use of white and pink roses across the stage and backdrop makes this decor look truly romantic! An arch full of roses that covers the bride’s and groom’s sofa with simple drapes in the backdrop. What’s not to love in this offbeat stage decoration? Pink is a colour that’s seen widely in Indian wedding decorations, and for all the right reasons! Just take this gorgeous stage for instance. The simple shelf backdrop covered with white and pink flowers in addition to the pink carpet make the whole stage decoration look just wow! Truly exuberant and grand, this flower decoration stage is what dreams are made of! The canopy of hanging flowers in the backdrop along with glass panels and large flower vases makes this stage decor look romantic! This lively yellow wedding decor is full of flowers and drapes, which gives it an Indian vibe. What’s cool is that it can be doubled up as a mandap decor if you replace the sofa with pooja essentials. A contemporary wedding decor idea, this one is glamorous with it shiny glitter strings, a train of white flowers, perfectly placed lights and a simple sofa. Bored of seeing flowers and chandeliers everywhere? Make way for umbrellas and Bollywood-inspired throw pillows that make for a fun stage decoration idea! Since you have lesser space at indoor weddings, a floral stage decoration like this is perfect. It has a nice backdrop of flowers along with bouquets at the foot and sides of the stage. Simple and beautiful. The gold sofa, drapes, and backdrop along with white and pink floral arrangement make this stage decoration perfect for an indoor evening reception! 35. Drapes, drapes & more drapes in this reception stage decor! For the drape-loving couples out there, this stage decor is like a dream come true. The multi-colour drapes in the background along with chandeliers and a golden sofa make this wedding stage design look spectacular! A chic and graceful stage decor, this one uses a lot of white, pink and purple flowers on a white backdrop making the whole set up look exquisite. Replete with greenery, plants, flowers and idols of god, this temple theme wedding decor is absolutely spectacular and perfect for a wedding that has an overall traditional theme. A simple stage decor, this one has a large ceiling of hanging flowers along with delicate chandeliers that give it a simple and attractive vibe. This kind of decor is perfect for outdoor spaces! Multi-colour drapes, LED lights, shimmer strings and a starry black backdrop. What’s not to love in this beautiful reception stage decor? A reception stage that looks like a chariot? Yes, please! Decorated with orange and red drapes and chariot like arches, this Indian decor is a great pick for traditional weddings. Which one of these latest stage decoration ideas did you find the most interesting?